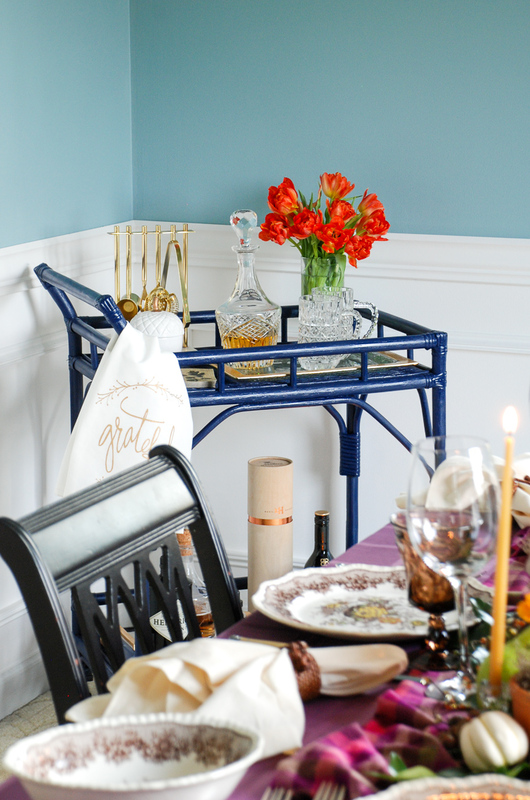 Gather friends and family around this autumn harvest table to celebrate the bounty of the season! 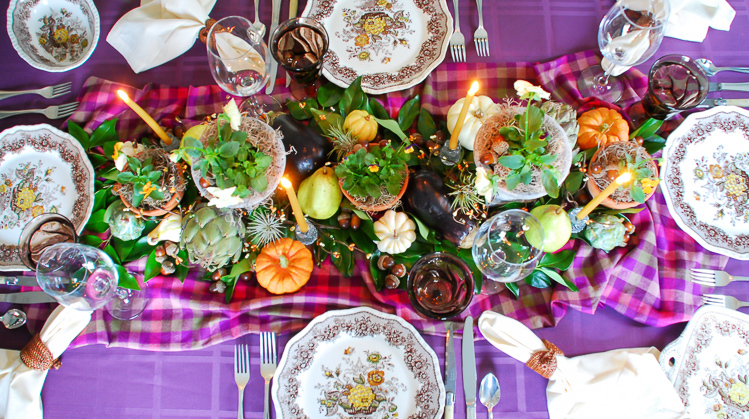 A natural table runner made from the fruits, foliage, vegetables, and flowers of fall is a simple, yet sophisticated way to decorate your table for autumn. Not only does it reflects the bounty of the autumn harvest, but it is also easy on the budget. 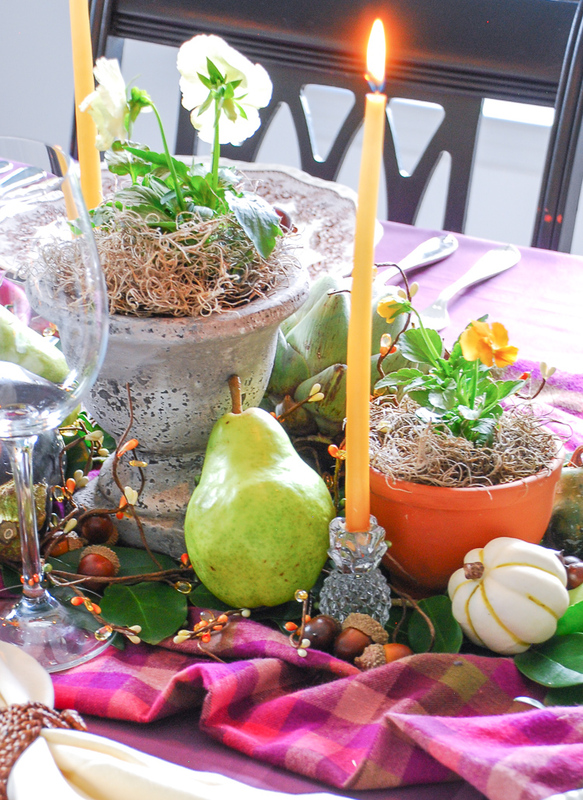 You can use fruits and vegetables that you would buy any way and repurpose fall potted plants. 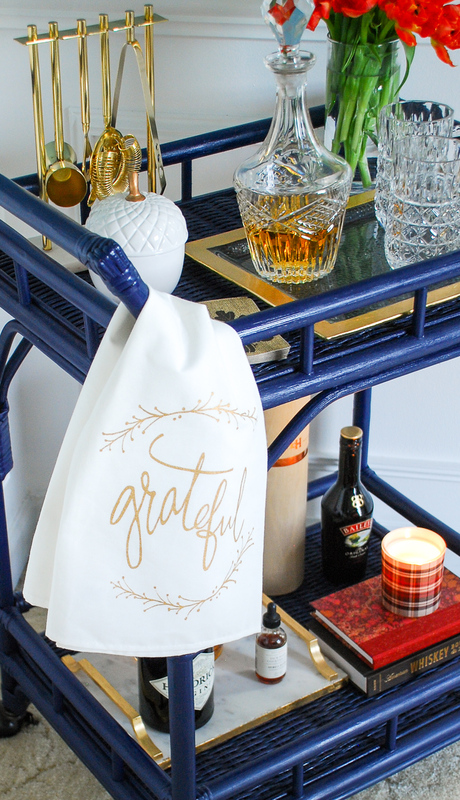 Your friends and family will be impressed by this autumn harvest table! 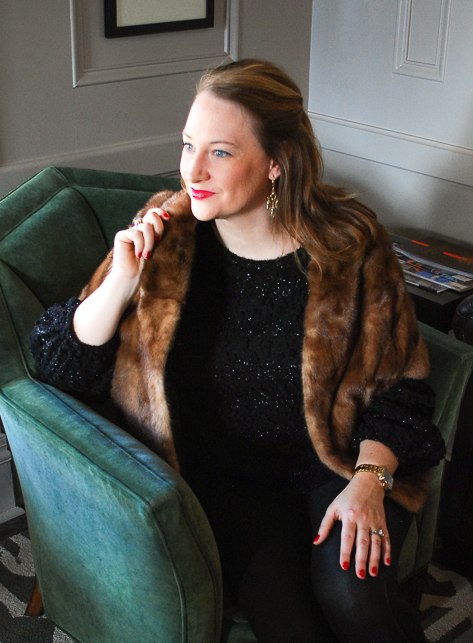 I’m loving this fall’s popular color palette of wine toned hues, particularly fig and magenta. I made those two colors my theme colors for all my fall decor, and you can see how I used them in my autumn front door here. 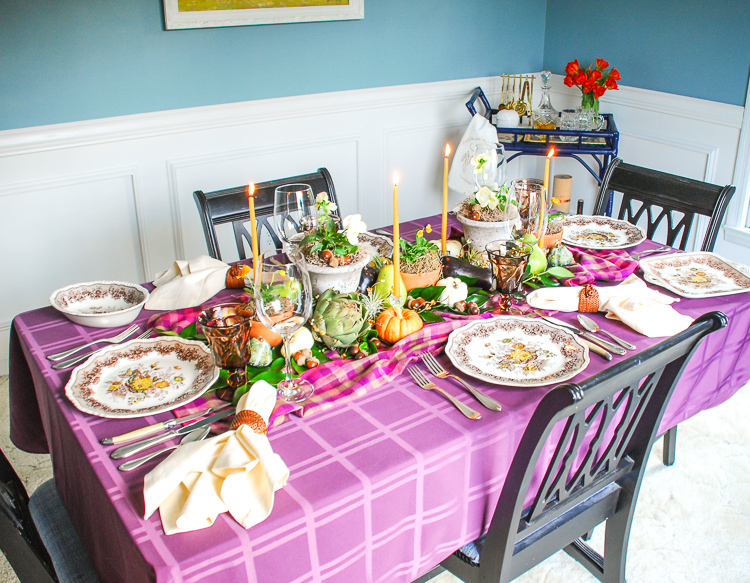 For this fall tablescape, I started with a beautiful woven fig colored tablecloth and then layered a piece of flannel plaid on top. 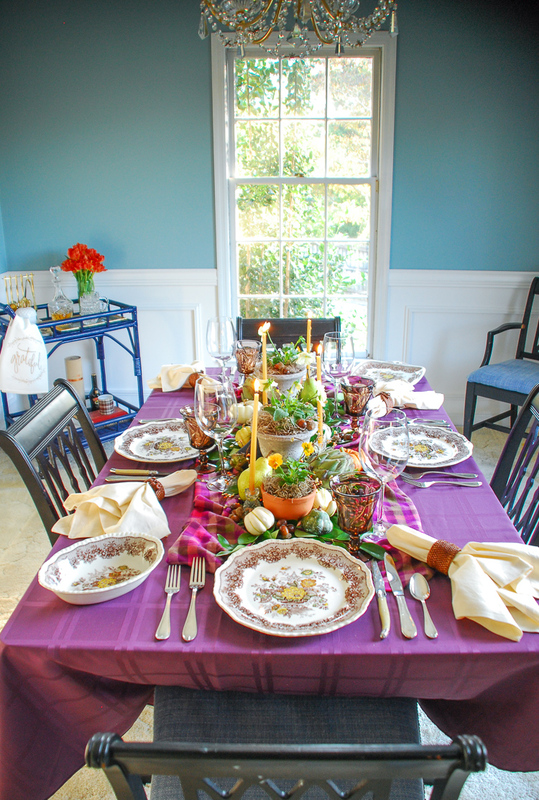 I used my fall china, Mason’s Ascot, antique silver, and Laguiole bone knives. To complete the look I added my brown glass goblets and bordeaux wine glasses. No. 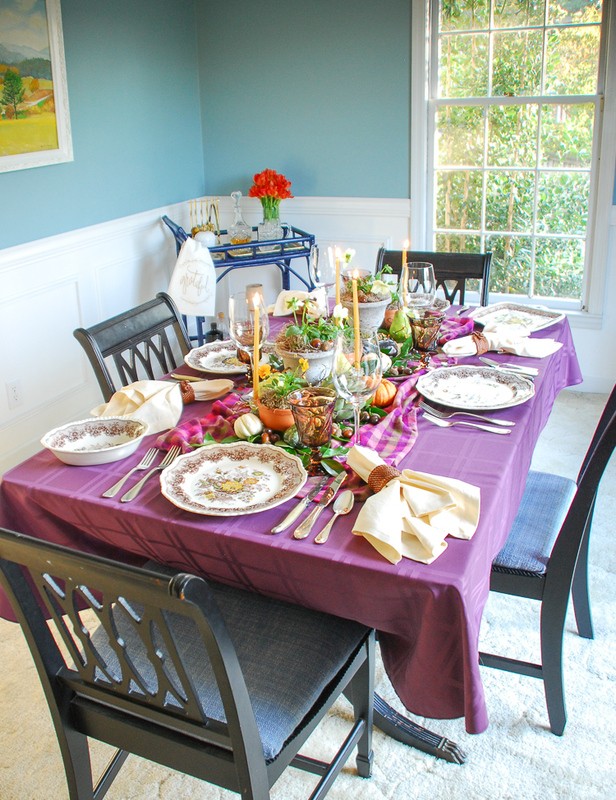 1 Choose a fall colored table cloth and then layer a complimentary runner across the table. No. 2 Place several small pots of fall flowers down the center of the runner (pansies, mums, asters, sedium, or chrysanthemums for example). No. 3 Set several candleholders with long tapered candles in between pots. No. 4 Lay fresh green or autumn foliage across the runner, hiding stems. No. 5 Place 2 or 3 kinds of larger fruits and/or vegetables (artichokes, eggplant, apples, pears, persimmons, pumpkins, etc.) amongst the pots and branches. No. 6 Intertwine fall berries, fresh or artificial, amongst these elements. No. 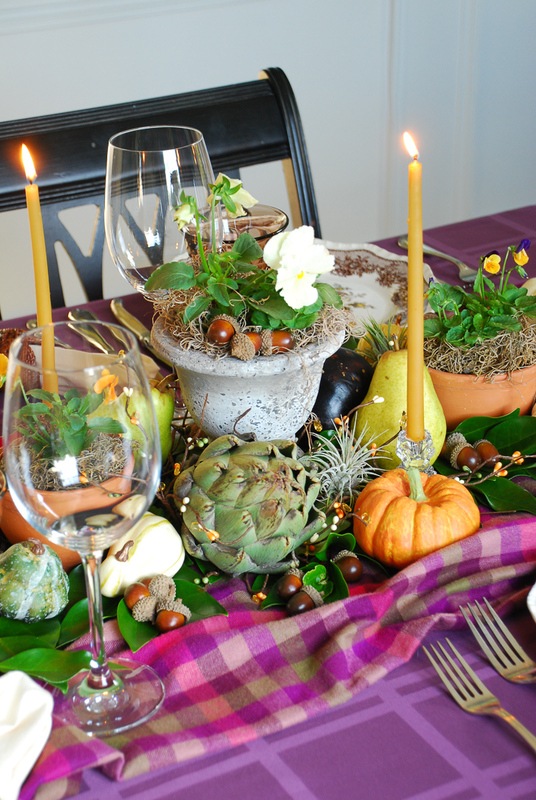 7 Fill in holes with smaller fruits, fall accents, and/or vegetables (acorns, mini gourds, figs, etc.). No. 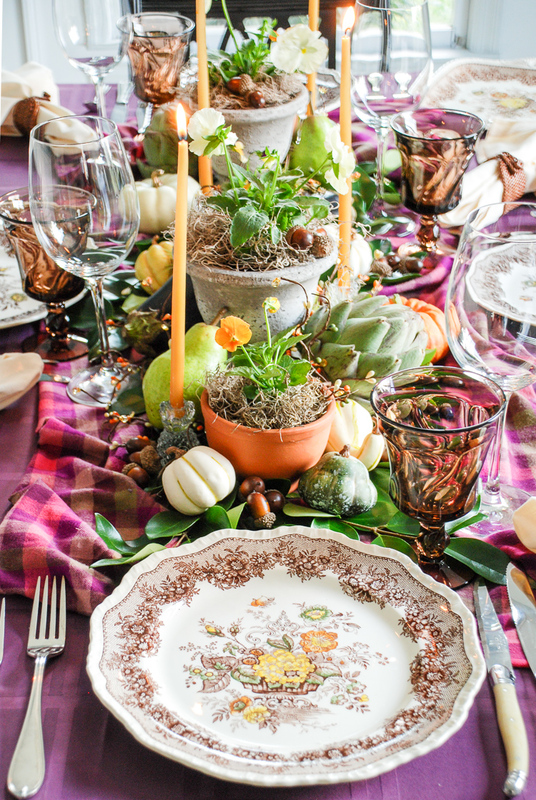 8 Set the table with your favorite fall themed china. No. 9 Add the correct flatware for your menu. No. 10 Complete the look with a neutral linen napkin. Love the purples with the autumn China! The mix of the colors is great. Think I’ll take your idea for my China and. cranberry colored table cloth. Always on the look out for new combination. Have a good day. Absolutely! So glad you like it. Purple is such a fun color to work with. Autumn blessings! Love the hues in your color palette! And the china is a pretty fall pattern. Thanks so much Sandra! The china is Mason’s Ironstone Ascot pattern.